Got a soon-to-be kindergartner on your hands? Mark your calendars because it’s already time to start thinking about registering him or her for the 2019-20 school year. Many Champaign-Urbana area school districts have already set dates for kindergarten pre-registration. We’ve rounded up information for several districts in Champaign County and beyond to help you start the process. Each district may require different documents to pre-register your student so check with yours to see what you should bring. Some may require a birth certificate, photo ID, and/or proof of residency. Illinois law requires all kindergarten students to have a physical, immunizations, and an eye and dental exam on file by September 1, 2019, although some districts may have other policies. However, these documents aren’t typically required to pre-register your child in the spring. The largest district in the area offers its Schools of Choice program to all families who register by March 30, 2019; the registration provides families the opportunity to pick their top five schools, and placements are revealed in April. Those who register for kindergarten after the Schools of Choice registration period will receive space in schools where seats are available (don’t worry, every child gets a seat.) For information about Champaign Unit #4 kindergarten registration, go here. Read one family’s journey through the process. 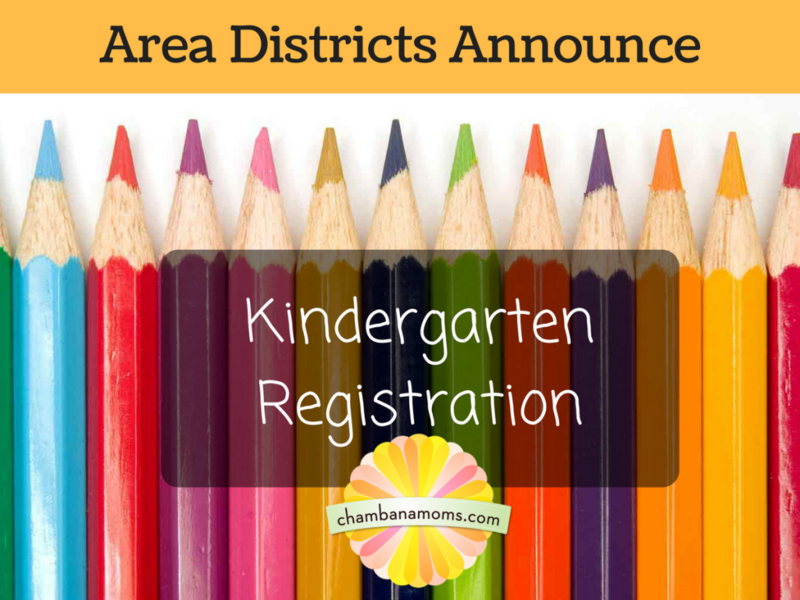 A primer on how to register for kindergarten in Urbana schools is available HERE. Kindergarten Connection is April 4 at Lincoln Square Mall in Urbana. Personnel from all Urbana elementary schools, along with other specialists will be on hand from 11 a.m. through 5:30 p.m. to provide information to parents and families about attending Urbana kindergarten. Each family attending Kindergarten Connection will receive a bag full of activities and materials to take home to your child. Staff will be available to guide and answer questions throughout the process. Parents are asked to bring an official birth certificate, photo ID, proof of residency, and phone numbers for doctors and emergency contacts. Pre-registration is available April 3 from 2:15-5 p.m. at the elementary school. The regular registration period is July 31-Aug. 1 from 1-4 p.m. and 5-7:30 p.m.
A parent informational meeting for incoming kindergarten students will be held on Thursday, March 7 from 6 – 6:30 p.m. at Middletown Prairie Elementary, 1301 S. Bulldog Dr. According to the website, the meeting will include information about curriculum and also the process for registering for kindergarten. The district will provided folders with all the information you need to begin the process and people will be there to answer any questions. For more information, call Middletown. Monday, March 11 – 10 a.m.-3:30 p.m.
Tuesday, March 12 – 10 a.m.-6 p.m.
Wednesday, March 13 – 10 a.m.-3:30 p.m.
Thursday, March 14 – 10 a.m.-3:30 p.m. Please bring your child’s certified birth certificate (from the courthouse with a raised seal) with you to registration. Physical/immunization forms are due by Sept. 1, 2019. Rantoul City Schools kindergarten pre-registration is typically held in mid-April. We will update with dates as we get them. For more information call (217) 893-5400. Visit the office or call to schedule an appointment. Appointments will be scheduled for March 26-27 from 8 a.m.-6 p.m. Forms will be filled out and assessments made at that time. Unity’s two elementary schools – East (Philo) and West (Tolono) will hold a kindergarten orientation on Monday, April 8, from 6-7 p.m. Kids are encouraged to attend. Incoming kindergartners and their families are invited to visit the school and learn about kindergarten at Unity East. Meet teachers and office staff, tour classrooms, and find out how you can help your child prepare for his or her first day. If you don’t know which school your child will attend, call the district at (217)-485-6510. Did we miss your school district? Share with us your spring registration information – email editor@chambanamoms.com.